Squash House Quilts: Pungent Beauties! Mr. Squash and I are taking off tomorrow for a few days in Oregon. We plan to fish the John Day River for Smallmouth Bass with a guide on Wednesday. On Thursday we'll travel a bit farther to Canyon City, OR and visit with our friends, Otis and Teresa for a couple of days. If you've been reading my blog for a while you'll know that Otis married us 10 years ago in the Minam River. It was his first and only wedding ceremony - and we still feel honored! We love this part of Oregon - it is home to the Painted Hills and the John Day fossil beds - a gorgeous geological wonder! We'll be back on Saturday. 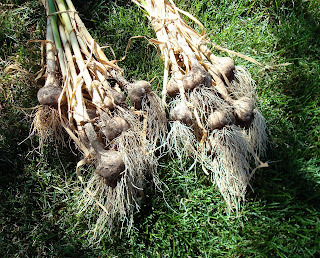 A few days ago I harvested the garlic! Last fall I planted a hardneck variety called Russian Chesnock Red. I love hardneck garlic as it is more flavorful and seems to keep longer. Here I tied them in bunches to get them ready to dry. You can be assured that no evil will come to the Squash House with these bunches of garlic hanging from the trees near the patio - they say that garlic wards off evil!! I hang them for a few days, then peel off the dirty outer layer, shake off as much dirt as I can, then allow them to dry a little longer before I cut off the tops and store them for use! Here is a clove I dried a while back. I was testing to see if they were ready to pick. This couldn't be a more perfect head! I smell a pot roast in our future! I make a recipe given to me by a friend most often. She says the first time she ever made pot roast, she thought a clove of garlic meant the whole head! But she said no one complained, so she's made it that way ever since! I've been doing a lot of hand stitching lately. This square is almost completed. It's a pattern from Crabapple Hill and I only have 11 more to go - lol! I'm using distressed linens in different shades of tan for the stitcheries and for the main fabric shades of blue, brown tan and black. If it's anything like Winter Wonderland, I might finish the stitcheries by this time next year before I get to sewing it all together! How totally neat!!! Love the pictures of this garlic. What a cool thing to walk by and see & smell in your beautifully giving garden. Guided fishing sounds killer! You're sure to find some great spots. Yippie. Enjoy. Ohh, my best to Sophie while you're away. Hugs, *karendianne. Well, Happy Anniversary to you two! Have a fun time...there will always be time for gardening and sewing when you come back. Your garlic cloves came out so much bigger than mine. I think I need to try your variety next year. I am drying onions and maybe some garlic to make my own onion powder...I'll let you know how it goes. So far I can say I am glad I moved the dryer out to the green house! That garlic is gorgeous!!!! I love garlic in everything. Those are just beautiful. I love to eat plain yogurt, cucumbers and garlic. Yum!! Scott is not a fan! LOL! Your stitchery looks so sweet. I love the birds. Have fun on your trip! I hope to see lots of pictures when you return! 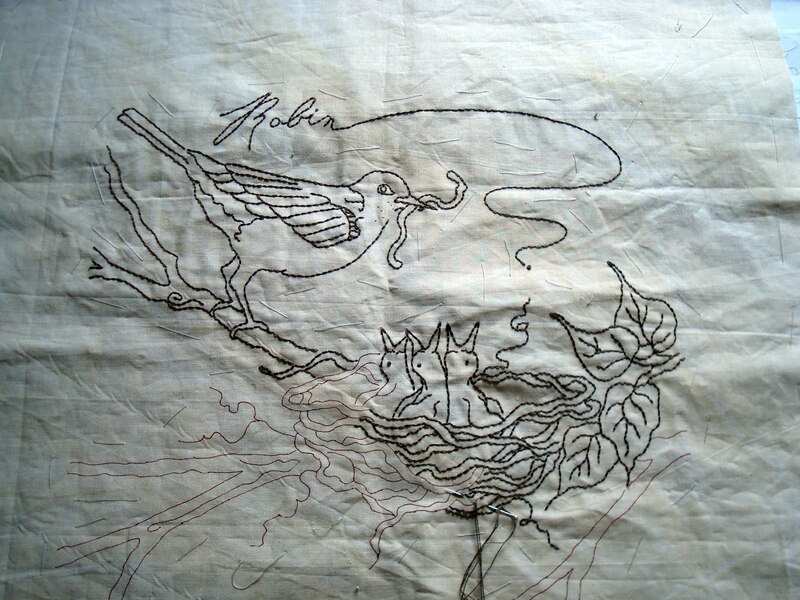 The stitchery looks lovely, a perfect hand sewing project for evenings for a long time. Have a nice fishing trip! Have a terrific trip. 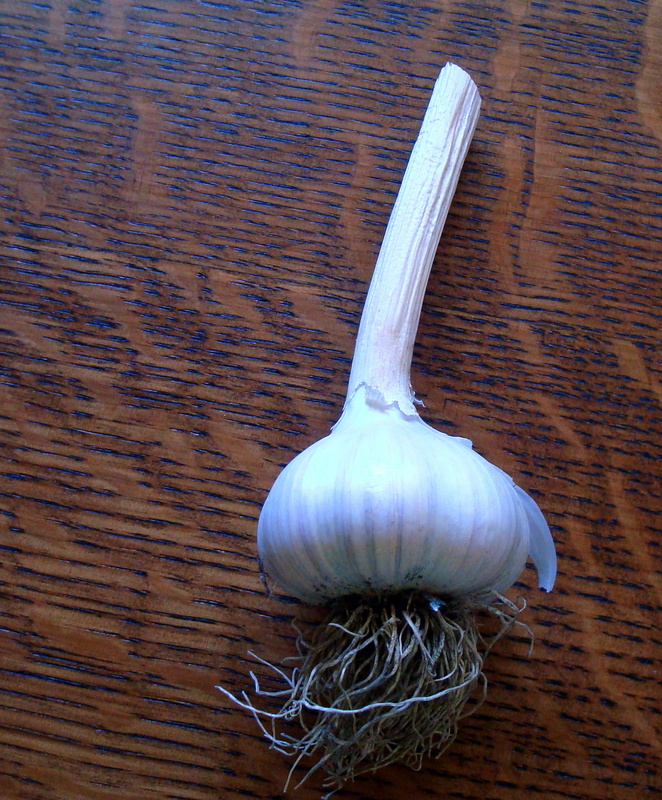 Your garlic is gorgeous. We have been getting some in our farm basket and it has the long dried neck and fantastic cloves. Crabapple has such lovely designs. This will be another beauty. Ooh what lovely garlic! 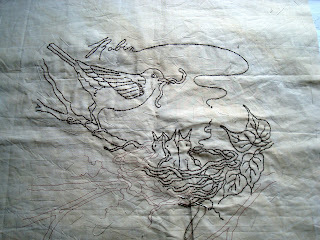 And beautiful stitching. Happy Anniversary. Have a great trip! I love that stitchery. One of the owners of a quilt shop did in with the French General fabrics. It is gorgeous. I know yours will be too. I planted some purple garlic this past fall and some elephant garlic which looks like an onion. I was told by the person I bought it from that I need to plant that bulb again and it should make cloves. So I will give it a try. We have decided to clear out some trees on our property so we can have a bigger garden. Can't wait. I love the pictures of your garlic bunches! I can only imagine how earthy and fresh they should smell. Your stichery is beautiful. I like your idea of using distressed linens for these desgins. Happy stitching! Catch a million and have fun! I must say that bass fishing is my favorite. Love that garlic. I plan to plant some in the fall too! Enjoy yourselves and travel safely. 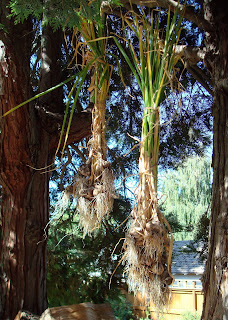 Here the tradition is to plait the stalks of both the onions and garlic and hang them to dry. They look quite pretty. You then just hang them in the kitchen and yank what you wish to use. Minam Lodge Wedding 10 Year Anniversary!